Do you know what happens when you upload a 10kb picture to Flickr or even a 100 MB video clip on Youtube ? Where do they go exactly ? The chances are that the file is uploaded to one of the database servers inside a data center located in some remote but secure location that you may not be aware of. CNet recently visited the Equinix datacenter facility which houses electronic data for Yahoo, Google, Microsoft, IBM, Adobe and even banks like Goldman Sachs or Bank of America. Some of these data servers are so huge that they can store upto 7 terabytes of Data which is equivalent to 2000 DVDs. And there are 5 levels of biometrics just to get inside the center. How a photo-sharing site keeps its data - Smugmug.com CEO explains CNet about how online photos are uploaded and shared on the Web. See the facility and learn how to tell when some clicks on a photo. See where the Internet lives - CNet takes us on a video tour of Equinix data center facilities which is responsible for holding massive amounts of data, including storage for popular sites like MySpace.com. 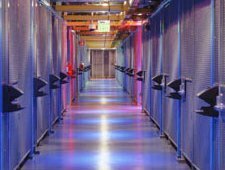 Equinix website also has an inside tour of the IBX data center with the architecture and the security measures.